I'm surprised looking through MY archives not to have found a single image of White-top anywhere in my files. But I think this picture pretty well depicts how the species spreads and looks on countless acres across the West. 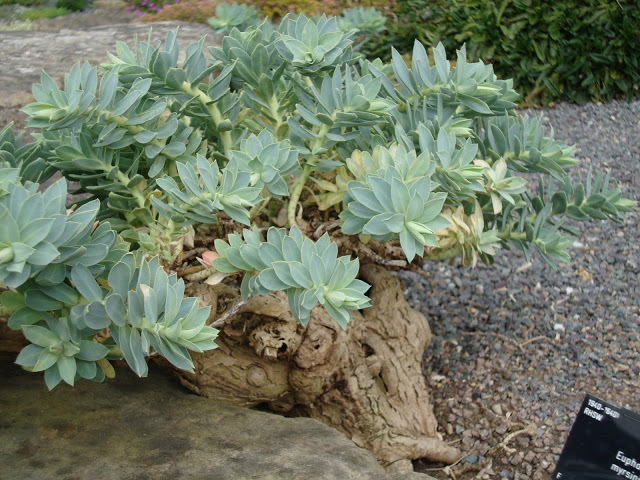 I will not SWEAR this species is Euphorbia esula--but it sure looks like it! I have seen the true species in Central Asia where it was likewise growing rather modestly, but in Colorado it has smothered countless acres. 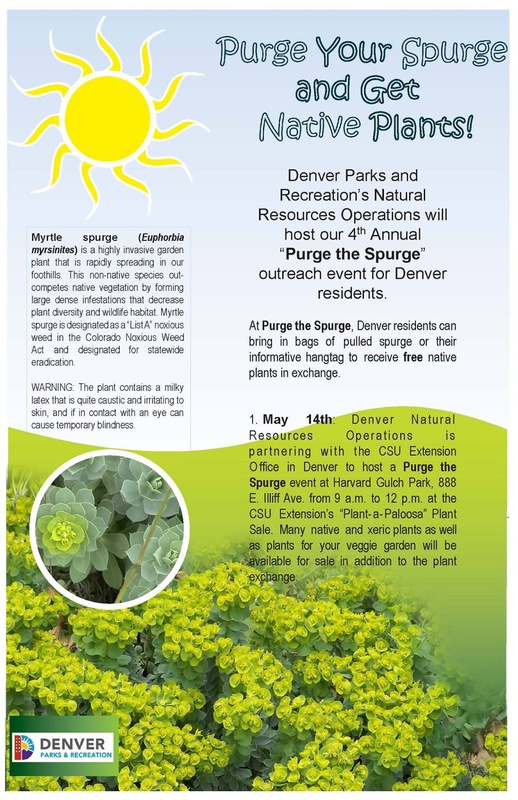 One of a dozens of pieces produced by various local agencies on the witchhunt for myrtle spurge (they're after Cypress spurge too--but not so often). Meanwhile the far more noxious spurge ramps on in municipal garden beds!!! I've seen it planted proudly in an arboretum in Kentucky...Not the best specimen, I'll voucher.. 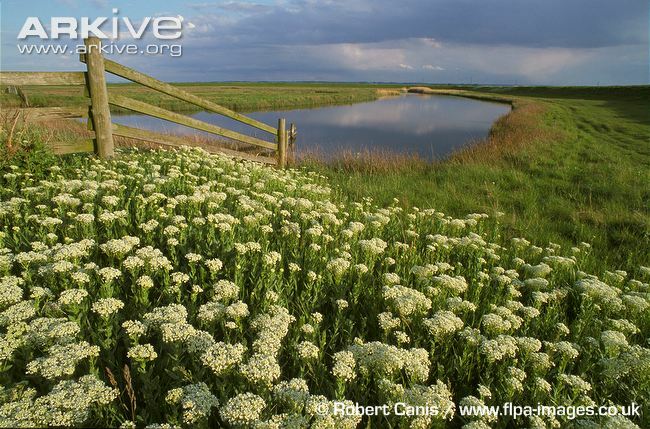 But first we have to distinguish which are the real invasive weeds, like Euphorbia esula, and target them instead of far less invasive and merely attractive (and therefore more easily identified) taxa like Myrtle Spurge. Keep writing . A fan. My experience is that in this climate (western Virginia) you *can* get ahead of garlic mustard, if you can keep it from going to seed. That means if it's a sizable patch and near or in bloom the weeder's energy is best spent cutting off the rosette at soil level (just this once! and into a container) and marking the area for a return visit -- because at that time of year there are so many other urgent tasks. The rosettes are easily spotted and can be completely extracted with swollen, turnip-like root any time the ground isn't frozen or baked hard. It's reassuring how little resurgence there is where a thorough sweep has been done. Thank you both for your comments. I certainly WILL keep posting,Lowrie (can't help myself, especially with such encouragement) and Nell, I've been thinking I should dig up that patch. You've convinced me to do it! I am having trouble believing the plant in the top photo is garlic mustard. The pedicel looks to be too long. Gleason and Cronquist say garlic mustard should have 5 mm pedicels. This makes the flowers look too open for it to be garlic mustard. The leaves also look too glossy and too widely spaced along the stem. I spend way too much time controlling invasive species. At least a few hours each week. A lot of beautiful wildflowers have disappeared from local preserves because of invasive species. The reason these communities have been on the warpath for E. myrsinities is because that battle can be easily won- the # of plants and colonies is practically countable. Horticulture introduced it (and I myself sold TONS of it in the 1980s) and now we have the responsibility to eradicate it. Neighbors in my rural community also "hide their plants" but we are continually seeing new plants sprouting and spreading in our communal open spaces, displacing native forbs and grasses and spreading aggressively. It can be deterred, and I for one, sir, am a proud member of the weed "gestapo." E. esula, on the other hand, is out of hand! It's pervasive, difficult to control, requires expensive herbicides and timing is critical. I've been battling it for over a decade now, and finally feeling a bit in control. You didn't mention E. cyparissas - also introduced by horticulture and just now becoming a problem in CO.
You are such a sucker for a pretty face, my friend! Love you despite your humanity sometimes! I have somehow ended up in Wisconsin's invasive "Species Assessment Group." I am the weed gestapo. Our native flora now comprises substantially less than half of our unculvated, unurbanized landscape in parts of the Midwest. It is such a crisis. No preserve is truly protected now without intensive invasive monitoring and control efforts in perpetuity. Even on land that was never clearcut or cut by the plow, a person cannot go and see the forest or the prairie. I always resented how little there was left for me, and watching it slip away in recent decades has been heartbreaking.